Image Compression - what is the best method? What is preferred method to get best image quality into a tiny file size? I've exclusively used "Save for web" in Photoshop and reduced file size in there. Would I get better results saving as 100% quality from Photshop and then using a compression tool? always consider the format you need to start with. Many forget that you have a PNG-8 to your disposal (256 colours or less), and depending on the amount of colours, this can be a GREAT option. But PNGs are a lossless format (large file size), you do need to be careful when using them. Do recall that JPGs are meant for pictures/photos, and possibly smooth gradients. Don't use JPGs for image text (text images? ), that's not where it's strength is - doesn't handle sharp changes in contrast to well. My recommandation is to never ever save @ 100% quality. The JPG is a lossy format by default for one, and for 2, once you pass 80ish% quality setting, there's a diminishing return in quality vs size. The quality gains at 80+ are less perceivable, but you'll suffer from file size. And the dimensions of the image will also play into this. The smaller the dimensions, the more you might be able to get away w/ lesser quality. always use something like ImageOptim. I mentioned this @ my #LitmusLive talk, but there are a few things that you want to deal with using PS exported images: metadata, and the sub sampling. 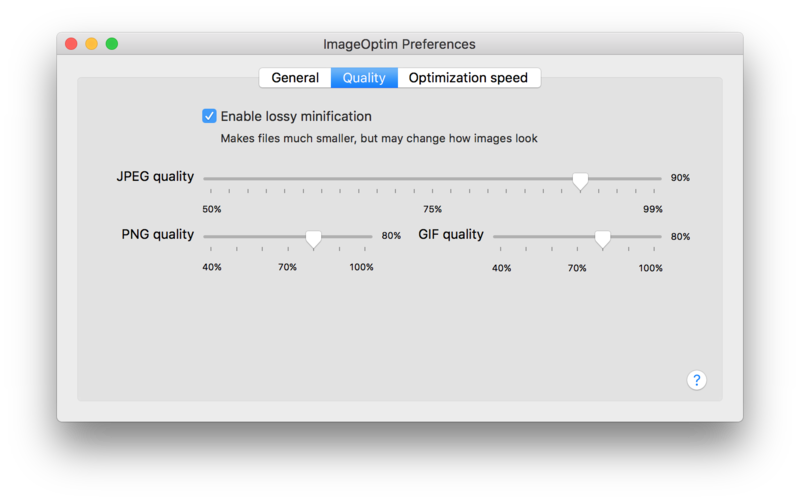 W/O getting into excess details, something like ImageOptim will take care of both for you. Thanks - that gives me a much clearer insight into the why as well as the how. I'd always followed the rules of jpg for photos and GIF (hard G) for graphics but haven't been sure where the PNG fits in. I'm often required to use text-on-gradient-on-photo and getting the best quality has often been a nightmare! Does making images progressive have any advantage in email as it does in web? Not a huge issue, but depending on where the image is. For any images that would appear above the fold/in the viewport when opening - something like a progressive jpeg would make some sense seeing that this is what the user is meant to be looking at immediately. So to keep a relatively good #ux, yes - as the user sees something getting clearer by the second (although there have been some arguments against it). Anything below the fold could potentially not need be progressive since by the time users get to them, they should all be loaded. But ultimately, you still want to make your images (esp the one above the fold) as light as possible to get as quick a load as can be. ok, good to know, thank you for taking the time to answer my question. Another technique for photos etc is to start with a very large image (2,000px width etc) but Save to Web at a quality of around 20. The shear number of pixels will counter any losses that JPG produces and you'll end up with a nice clear image but at a much lower file size. This is a technique that was discussed some time back, but you run into several challenges. On a non technical level, the sad surprise will be when your user goes to save the image - which we know they do, and it will be saved at the very poor quality you provided, in it's large original size, something that might just send marketing and their branding dept in turmoil. On a more tech level, an issue that plagues mobile devices is the abundance of poorly sized images, and how they contribute to crashing devices (esp on android). Memory used will be w x h x 4 (rgba). So no matter what the container size, you're faced w/ massive memory usage. In your case: 2000px x 2000px x 4 = 16,000,000 bytes. Let's also add the fact that images need to be decoded, and the larger the image, the greater the decoding tax (time) - which is a strain on the processing. Essentially, going with images that are excessively too big is a lose lose. In light, I would avoided this. for JPEGs , I would likely go from PS right to imageOptim. 1st PS for the sizing and whatever ever photo editing needs you might have. I would then save it w/ the edit and resolution you needed and at hi q. I would send it right to IO afterwards and pick the quality you need there (as you can set that). For one, IO uses better and more up to date encoders, I'm next to certain that IO employs both Guetzli and MozJPEG (BTW, unless you're encoding using Guetzli at a q90ish or greater, you're fine w/ MozJPEG + it's Guetzli is slow, something that even Google has acknowledged), and as you mentioned IO will take care of other things that PS will not - like sub sampling. re: PNGs, by going from 24bit to 8bit, you are discarding a lot of colour information. As long as you know that you're going from 16M colours to 256. Since you did mention transparency, you're also going from 8bit transparency to 1bit - meaning you're going from gradient capable transparency (a true alpha channel) to what will be an alpha channel that's on or off - what you get from GIFs (89a). And unless you're absolutely in need of an animated GIF, I would replace it w/ a PNG - you will almost always get better results from it. DO remember the PNG came about as a GIF replacement in the 1st place. In rare occasions will the GIF be smaller than a PNG. Hope this might have offered some insight. ImageOptim will handle all file formats for one. 2, using PNGs is fine, but I would likely keep it at PNG-8. I just don't see an argument for PNG-24 esp as a lossless format. Likely far from needed. I dont save imgs at 100% quality and use ImageOptim to compress. I would never recommend saving at q100. In fact, I would not go north of q85. There comes a point where we're looking @ diminishing returns. Your size jump -vs- quality north of 80ish (on avg) will likely not be worth it. I would start to test your quality around 75 and see what works for you. Don't forget the size of the image and detail you're looking for from this img. I may have mentioned this somewhere in this post already. The most aggressive encoder that i know of is for webp which is a different topic all together. But here's what's most important : file size. For one, the trade off when you go to higher q settings isn't worth the additional file size. This has been the accepted notion. Ask the engineers behind ImageOptim as well as WebPageTest - they're on record saying this. Also, do recall that the jpg is a lossy format by design. q100 makes little sense ultimately, added that the q (quality) rating isn't standardized - meaning, q85 with one application will not be the same as q85 on another. Again, the goal is file size. If it weren't we'd be using PNG-24s. Also, do recall that the jpg is a lossy format by design. q100 makes little sense ultimately, added that the q (quality) rating isn't standardized - meaning, q85 with one application will not be the same as q85 on another. Again, the goal is file size. If it weren't we'd be using PNG-24s. I'll find some documentation and post it. We handle this invisibly to the designer. They use a "full fat", high-res png, and then on the first use of the image (always in testing), the image is run thru kraken and replaced with a light version that is scaled to the right size. There is some magic going on to create the 2x images, etc. This way designers don't have to worry about compression or sizing and we always have the high-res png saved with the email. The same mechanism is used on web site images. Recently, we've switch to putting all of our images in a database, so the code refers to them as img_##. Server pull the right image from the database. Advantage of this is that switching out the image from FPO to live is really easy. I use the same. It's awesome. Does not work on .gif files though, but anything in a normal .jpg or .png is just fine. Doesn't lose image quality on compression unless you run it through multiple times. Just use tinypng website, it is best. When I'm creating assets in Photoshop, I usually use the "Save for web" feature, following by using imageoptim. Imageoptim is a big help for getting the file size of png's down. I also use save for web in photoshop. have you ever tried imageOptim? great tool. They have GUI and CLI version and free to use. Don't need to compress an image after using "Save for web" in photoshop, But if you want to check then use tinyjpg.com, That is the best tool for image compression. save for web will almost always provide additional metadata that you should remove. That's the 1st thing I would make sure to be aware of when using PS. Much of it is not needed unless noted otherwise, by say photographer. As well, anything thing that is saved by PS that is greater than 50% will be saved w/ a YCbCr of 4:4:4. The accepted format for images on the web is pretty much 4:2:0. Won't get into the details, but this is why a 3rd party app is needed to handle the chroma sub sampling or until PS provides more options - and this by no means an attack on PS, just something that needs to be done post Save For Web. Of course you can compress after 'Save for Web'! Have you tried it?